Opinion: All Of These Subtle Changes - Has Apple Gone Rogue? Early on Tuesday morning, Apple quietly posted a press release announcing the upcoming launch of the larger capacity 128GB iPad. There was no invitation to a special event. No independent theater got an Apple makeover. The rumor didn’t even have time to churn. Apple just dropped that bomb on us with no fanfare. What is happening to Apple? I used to pride myself on knowing what to expect from the iPhone maker. You could practically set your watch to their reliability. For example, the company always waited to announce a new product, even just a refresh, until there was some kind of event to announce it at. With today’s news, it sends my world spinning out of control. I don’t know what is up or down anymore. I feel like I did when I was a little kid. Mommy would tuck me in and give me a kiss on the forehead every single night. One night, she forgot to give me a kiss and I worried that she was going to leave me. I had nightmares that night. I may have them tonight, too. For three years in a row, Apple followed the same product announcement pattern. The new generation of iPad launched in the spring and the new generation of iPhone, along with any updated iMacs and iPod touch devices, launched in the fall. I planned my electronics budget around it. When Apple launched the refreshed fourth-generation iPad with a significantly faster processor this past November, it was like someone had punched me in the face. I had enough money saved for the new iPhone. 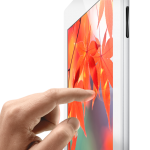 A new version of the iPad wasn’t supposed to launch until the following spring. My iPad still had that “new car” smell and it was suddenly discontinued. Now, I don’t know what to do. If Apple does launch a fifth-generation iPad in March, who is to say they won’t release a better one six months later? They’ve broken all of their rules. That is, they’ve broken all of my beliefs of what their rules are. I know that a lot of you feel the same way. When Apple announced the fourth-generation iPad, weren't you all stunned that the company would just change their routine like that? I know that today's news came as a shock to many of you. We are so used product announcement events. Don’t you long for the days when Apple would actually surprise us with an exciting new gadget, instead of leaks making the announcement seem old before it even becomes news? I guess I just want the security of familiarity. I want to know that Apple will only release a new version of my device once per year. I want to feel the anticipation leading up to an announcement, hoping for something big, but knowing I’ll buy it no matter what. I guess I want Steve Jobs back. Sorry Tim. It’s nothing personal. Could A 128 GB iPad Model Be Just Around The Corner?